Editor’s note: This is the eighth installment in a series of dispatches from the Rath family (Colin & Pam, daughters Breana, Meriel and Nerina, dog Aspen and cat Wasabi), who departed Stamford, CT last fall for a worldwide cruise aboard their Hanse 545 Persevere. You’ll find previous articles listed below. The Transatlantic Race really started four years ago for me, when I purchased Persevere in May 2011. I had it all scheduled, crewed in preparation for the Transatlantic Race 2011, but due to a mast delivery delay I decided to cancel. It didn’t make much sense to do a shakedown cruise in the middle of the Atlantic. In hindsight, I don’t know why I thought I could make a brand new boat ready to race 3,000 miles in two months. After four years of racing and cruising, making upgrades and changes and seeing how she handles in weather, I barely got her ready after working 24/7 for month at Newport Shipyard earlier this summer. This was the first real major overhaul that we have done to Persevere since we launched her. We already had the bottom done in Nanny Cay, Tortola and I have been upgrading systems over the years, but I wanted to make sure she was ready since we were leaving for good and anything else would be done overseas going forward. The rig was removed, checked, greased and improved by Southern Spars for three weeks and we still had problems that required us to suspend racing and head for the docks in Newport to decompress the rig and reattach the D1 that became loose. This mishap cost us over five hours and the weather window, which put us out of contention in the Transatlantic Race 2015. It also added another three days to our crossing due to lack of wind. I am sure all boat owners know that you have to keep on top of the services in a project of this size, and I was at the boat at 8 am every day to make sure everything was done, testing to make sure that each system worked as it should, and getting them back if they didn’t. So, a leisure month in Newport with my family transpired into a full-time job as project manager to prepare Persevere for her trip across the pond. I got 95% of what I wanted done, and the family ready to fly to Heathrow. Or so I thought. Pam had to redo all of our dog Aspen’s certificates. She also had to have the new certificates endorsed by the USDA. Their office was not far from JFK, but she still missed her flight. To her credit, Pam pulled through once again and beat us to Cowes. July 1 was a beautiful day for a race, sunny with a nice breeze at 12 to 16 knots, and we were on the starting area two hours ahead of time. We were setting up for the race and needed to bring down the main. Heading downwind to work on the main, the top part of the sail caught wind and sent one of my crew off her feet and headfirst into the rub rail. Her head was bleeding, so we got out the med kit and stopped the blood flow. She was a bit disoriented and didn’t remember what happened. Our medic, watch captains and I didn’t want to risk a concussion at sea, so we and called an ambulance and went to the dock at Fort Adams. We gave the medics her medical history and told them what happened, and then off went to start the race. We started mid-fleet and were doing well, keeping pace with our fleet for a few hours. Then we noticed the D1 had detached from the leeward spreader, so we suspended racing and returned to the dock again. It was fair to say that the crew’s spirits were not the greatest and there was talk about abandoning, but as those that know me can attest, my boat’s name isn’t happenstance. So, we did what was needed and rejoined the race five hours later. We knew that we just had to finish the race in order to win the Storm Trysail Club Cup (by default, since we were the only entrant racing for STC. Hey, it’s not my fault that other members didn’t race for it). We decided to enjoy ourselves and race the whole race, including the coastal race. This was an adventure of a lifetime and a life changer for many of my crew and myself. The 19 days at sea involved a bit of drama. 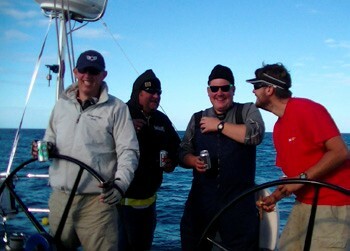 We had series of squalls up to 50 knots and days of doldrums, chasing apparent wind and moving at 1 to 3 knots. 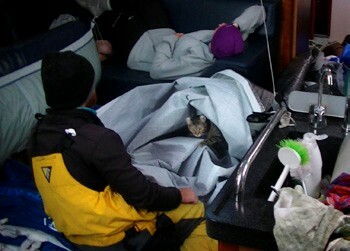 We tore five sails, and Joey and Stu and worked together to mend everything with assistance from our cat Wasabi. Wess had to quick turn to avoid two whales. My daughter Breana, at 14 the youngest sailor in the race, really came into her own, setting her personal record of driving the boat at 16 knots. The race record went to Nick, who hit 18.7 while surfing waves and got his initials and speed on the nav station. Fifteen days out, we came across a couple guys rowing across the Atlantic at about 1 knot, so we talked on VHF and shared weather information. They were 30 days out and expecting to reach England in 54 days. That really puts things in perspective, and we decided that sailing with all our creature comforts at 3 to 5 knots was really not bad compared to the alternative that had just rowed up. There were a lot of movie nights on the flat screen, which started as early as noon in the doldrums. Persevere has over 600 movies, as well as all the shows up for an Emmy this year. All in all, things worked out well and we finished the Transatlantic Race at 0300 with Breana driving. Cigars I had picked up in Cuba came out, along with two cases of beer and assorted hard alcohol, which was quickly consumed as we started the second coastal race, a much-needed break and re-calibration that lasted until noon the following day as off-watch crew slowly retired. As luck would have it, we got another night of drifting with only the tide moving us as the wind died. Persevere came into Cowes the following day, and to our surprise we got a gun when we finished. It turned out we had won our division in the coastal race. Need I say more?…Persevere. We were greeted on the dock by James of the Royal Ocean Racing Club, with champagne, beers, chocolate milk and soda for Breana, and cat food for Wasabi. 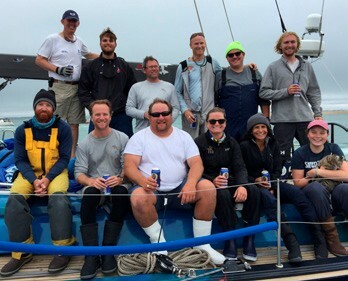 We were offered a drink at the RORC bar after we cleared customs, and the rest was a night of revelry. It’s Time for the Fall Boat Shows!